Each year, Rotary funds some of the world's most dedicated and brightest leaders to study at Rotary Peace Centers. Through training, study, and practice, Rotary Peace Fellows become catalysts for peace and development. Many go on to careers with governments, NGOs, the military, law enforcement, and international organizations like the United Nations and the World Bank. Programs Each year, The Rotary Foundation awards up to 50 fellowships for master’s degrees and 50 for certificate studies at premier universities. University Admission Upon selection and notification, shortlisted candidates must apply for admission at their designated university as dictated in the Assignment Letter. The fellowship will be nullified if a selected candidate is unable to gain admission. 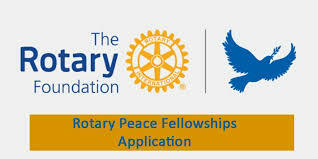 Receiving admission to a partner university before application to the Rotary Peace Fellowship program does not guarantee that a candidate will be selected for a fellowship. The Rotary Foundation offers a comprehensive funding package for all Rotary Peace Fellows. For master’s degree fellows, the Foundation covers expenses related to tuition, room and board, travel to and from the peace center, AFE experiences, conferences, and research. Professional certificate program fellows receive funding for expenses related to tuition, on-campus accommodation, course materials, insurance, travel to and from the peace center, and field study experiences.